Degree student Jordi Parra has created a gorgeous prototype Spotify player, the Spotify Box, that uses RFID-tagged magnets to play playlists from the music streaming service. The circular tags can be linked to music in your Spotify account and, when connected to the player, access the relevant music on Spotify using a Wi-Fi connection. Well, that's the idea, but for now the working prototype has to be connected to the computer to play music, although Parra reckons using a Linux system it could be possible for it to access Spotify alone. The retro design of the Box itself is certainly very appealing to the hipster within. 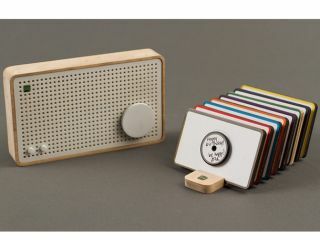 Made with materials intended to make the player affordable (Parra estimates production costs of around $50), the wooden player intentionally speaks of old radios and Braun devices. It would certainly offer a more affordable option than a Sonos player (around £400) and would be great for anyone with a desktop PC who wants to listen to Spotify playlists around the home - check out the video demo here. Such a clever idea deserves to make it into reality, but Parra isn't convinced given the complex electronics, software and customer support it would require. Still, with input from Christian Wilsson, Art Director at Spotify, coming in throughout the project and a lot of internet love for the device, there could be hope for the Spotify Box yet.